(Nanowerk News) Technology in common household humidifiers could enable the next wave of high-tech medical imaging and targeted medicine, thanks to a new method for making tiny silicone microspheres developed by chemists at the University of Illinois. Led by chemistry professor Kenneth Suslick, the researchers published their results in the journal Advanced Science ("Magnetic, Fluorescent, and Copolymeric Silicone Microspheres"). 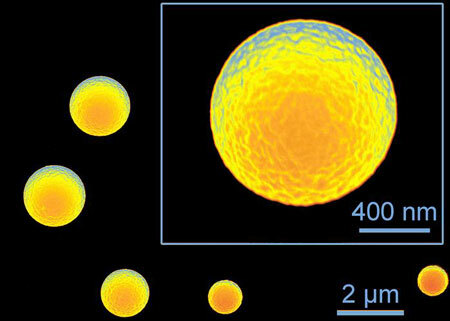 Microspheres, tiny spheres as small as a red blood cell, have shown promise as agents for targeted drug delivery to tissues, as contrast agents for medical imaging, and in industrial applications. One prime contender as a material for microspheres is silicone, the rubbery plastic found in everything from bathtub caulk to kitchenware to medical implants, but a method of making silicone into microspheres has eluded scientists. Silicone owes its versatility to its unique combination of properties: It is biocompatible, heat resistant, chemically stable, waterproof and environmentally benign. Yet some of those same qualities have frustrated researchers attempting to make silicone microspheres. The traditional microsphere-making method of suspending tiny droplets of material in another liquid does not work with silicone. "For silicone, creating a stable emulsion of small droplets is very difficult," Suslick said. "Even if a stable emulsion is achieved, you run into even bigger problems when it is heated, which is necessary to polymerize into solid spheres. Upon heating, small droplets of silicone starting material will coalesce with other droplets and produce only bigger spheres." The Illinois team uses a technique called ultrasonic spray pyrolysis, which employs technology found in household humidifiers to create a mist of ultrafine droplets. Suslick's group has pioneered the technique for a variety of materials, and teamed up with U. of I. chemistry professor Catherine Murphy to tackle the problem of silicone. The researchers send a mist containing all the ingredients of silicone through a heated tube, which solidifies the mist into tiny spheres of silicone. Because the droplets are all separate within the mist, they don't stick together like they do in an emulsion, so the resulting microspheres are roughly 100 times smaller than any previously reported. The researchers made silicone microspheres with a variety of properties for different applications, including colored, fluorescent and magnetic spheres. Because the spheres are bio-inert - they do not react with chemicals in the body - and the researchers believe they would be excellent vessels for extended-release pharmaceuticals. They are also exploring potential applications of solid, hollow and magnetic microspheres. "The applications for silicone microspheres, to date, have been almost entirely speculative, simply because no one has been able to actually make them," said Jacqueline Rankin, the lead graduate student on this project. "With this new method, silicone microspheres can be easily and readily synthesized, facilitating the exploration of technologies that have only been speculated upon and creating novel technologies and new science in a number of scientific disciplines."